Mario Balotelli says he will miss little about life in Manchester after taking a swipe at English culture following his £19m move to AC Milan. The Italy striker was paraded by his new club on Friday and did not shy away when asked what he liked and disliked most about England. "Good things? Only when I get to Carrington to train, so my team-mates and manager," he said. "Bad things? Everything else - press, weather, food, the way you drive." Balotelli, 22, has agreed a four-and-a-half-year deal with Italian giants AC Milan after scoring 30 goals in 80 appearances for City. He was at the centre of several controversial incidents, both on and off the pitch, during two-and-a-half-years in Manchester. 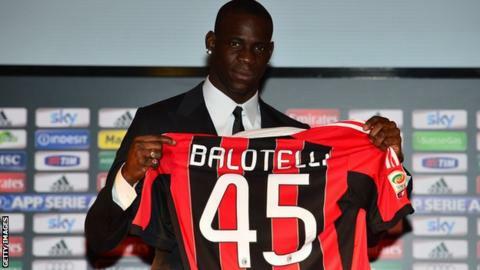 But Balotelli told a news conference in Milan: "I prefer playing - not talking. "To be a player for Milan has always been my dream so I'm very happy. "Now I'm at Milan it's very important above all because I am close to my family and friends. Manchester is not so far, but it's not close like Milan." Asked whether he planned to return to the Premier League before the end of his playing career, Balotelli added: "It is an amazing league and I think it's the best, together with the crowd and the pitches. But he added: "I don't know for the future if I could go back or not."